Waste sorting is done by robotic arm that detect, picks and places it separately using the sensor array. For effective implementation of waste management strategies, robotic has a leading role in fastening the process for further recycling and reducing the cost. A two arm robot can sort 4,000 picks per hour, showing the greater capacity than the human manpower. The rising population and their consumption are increasing the waste produced from various households, commercial areas and industries. Usual composition of garbage that people throw in are 5.8% metals, 3.5% glass, 12.9% papers, 1.6% plastic, 1.8% textiles and 53.7% biodegradables which means remaining 20.7% of the wastes is going to landfills. The advanced technology can help enhance recycling rates and divert useful resources away from landfill. In metal and mining industry, sorting robots can segregate metals, rare earth minerals and organic components from waste that can be used to manufacture products such as plastic and chemicals or to produce energy. Goldstein Research analyst forecast that the global waste sorting robots market size is set to reach USD 12.24 billion by 2024 growing at a CAGR of 16.4% over the forecast years. The technological advancement, increasing waste from various sources, difficult processes of sorting, government regulation towards waste management, and growing recycling industry are some of the factors than will escalate the global waste sorting robots market as per the forecast. The report covers the present ground scenario and the future growth prospects of the waste sorting robots market for 2016-2024 along with the sales and revenue of the waste sorting robots. We calculated the market size and revenue share on the basis of revenue generated from major players across the globe. We have forecast the market on the basis of shipment of the waste sorting robots, technology advancement, demand and supply, total waste sorted, various industries using waste sorting robots, total expenditure on waste sorting robots. On the basis of end-user, recycling industry segment had the largest market share of 52.1% in 2016 of the total global waste sorting robots market. To comply with various government regulations related to the waste management and recycling along with rising opportunities for large players in recycling industry, has accelerated the recycling industry market share. Plastics industry segment has been growing at a rate of 12.5% for the reason that various industries are using plastics, which are being manufactured by recycling the old plastics and other resources. Waste sorting robots market outlook 2016-2024, has been prepared based on an in-depth market analysis from industry experts. The report covers the competitive landscape and current position of major players in the waste sorting robots market. The report also includes porter’s five force model, SWOT analysis, company profiling, business strategies of market players and their business models. Global waste sorting robots market report also recognizes value chain analysis to understand the cost differentiation to provide competitive advantage to the existing and new entry players. The large manufacturers are innovating the waste sorting robots, thus there is a trend of making robots equipped with artificial intelligence (AI), which uses proprietary algorithms that is connected to a multi-layer neural network system to sort at super-human speed and diverting materials for re-processing, which may otherwise go to landfill. ZenRobotics was the first company to manufacture waste sorting robots equipped with computer vision, machine learning, artificial intelligence (AI). According to the report, major driving factor for the growth of waste sorting robots market is the need for having faster processes in waste management to handle the waste produced, which is increasing at a double rate. The robots picking speed ranges from 3,000 to 6,000 picks per hour working 24/7, with 98% accuracy. Further, major challenge faced by waste sorting robots market is the high cost and high maintenance of the waste sorting robots, which makes it difficult for the small companies that contributes considerable market share in the total number of companies engaged with waste sorting activities. Based on Geography, North America accounted for major share in waste sorting robots market having 33.4% in 2016. North America has high penetration of waste sorting robots mainly in waste recycling industries and also experiences high investments in innovative technology development. Europe is growing at a rate of 11.2% annually due to the presence of large waste robots manufacturers in this region have large share in the total global waste sorting robots market. 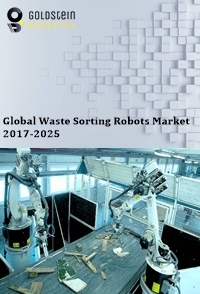 Global waste sorting robots market report comprises of the following companies as the key players in the waste sorting robots market: ZenRobotics, Sadako Technologies, AMP Robotics, Waste Robotics, Alpine Waste & Recycling, Resource Recycling, Inc.
What is the revenue of waste sorting robots market in 2015-16 and what would be the expected demand over the forecasted period?